This plugin integrates Checkout payment Finland with J2store. This is your merchant ID provided by Payment Checkout Finland. Enter your security key provided by Payment Checkout Finland. 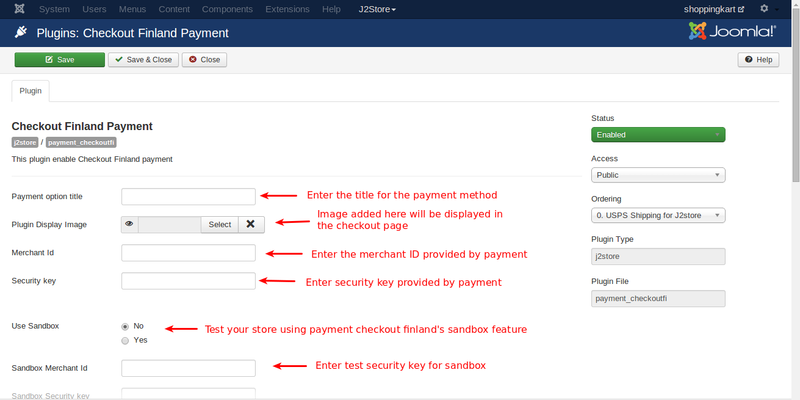 Payment Checkout Finland offers a testing suite called Sandbox. Before going live, you can test your store using this payment's sandbox feature. Use your Payment Checkout Finland's Sandbox merchant ID. Use your Payment Checkout Finland's Sandbox security key.